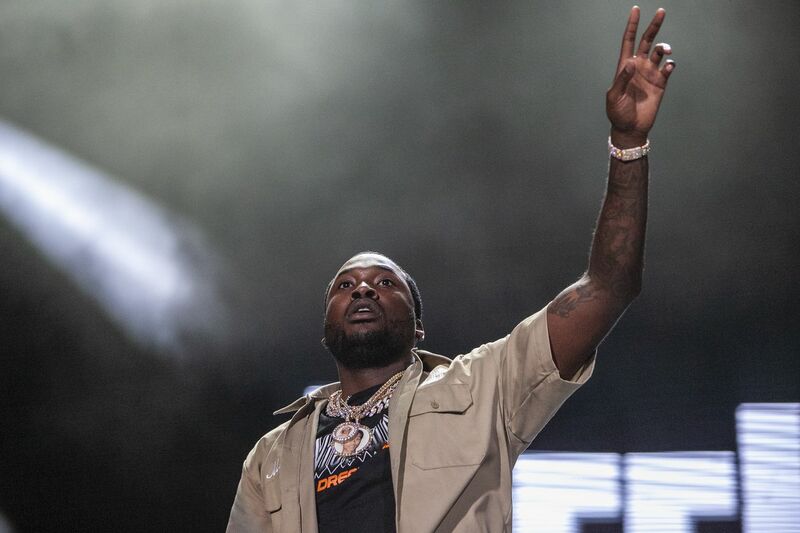 Drake's long-running beef with Philadelphia rapper Meek Mill is officially over after the two rappers appeared onstage together over the weekend in Boston. Mill appeared alongside Drake at the Canadian rapper's show at Boston's TD Garden on Saturday, where the two performed Mill's "Dreams and Nightmares" together. It was the pair's first time appearing together since the start of their feud three years ago, which kicked off with a series of diss tracks. The move could be seen as a diss toward the New England Patriots; the song became the Eagles' anthem during their Super Bowl run last year. Drake, however, was focused mainly on squashing his beef with Mill. "I want to say something right now. This right here is a long time coming," Drake said after the performance on Saturday, according to Rolling Stone. "This right here is important. This is one of my favorite rappers, for real for real. We need more peace in the world. We need more love in the world. Meek Mill, that's my brother, that's my n- from day one, so we were able to do this tonight in front of y'all." The pair's high-profile feud dominated celebrity gossip sites back back when it started in 2015. At the time, Mill accused Drake of using a ghostwriter for his tracks, including on "R.I.C.O.," a track from Mill's Dreams Worth More Than Money. Drake responded with two successful diss tracks, "Charged Up" and "Back to Back Freestyle," to which Mill responded with the poorly received "Wanna Know." The feud continued up until Mill was sentenced to prison following a probation violation last year. Following the Philly rapper's imprisonment, the beef dissipated to the point where Drake began to support efforts to secure Mill's freedom, while Mill said he had "moved past" the situation earlier this year. "What happened happened," Mill said in an interview with The Breakfast Club in May. "We moved past that. I think we'll have a conversation next time we see each other, and get it going." The pair's performance together came following Mill's appearance at Made in America here in Philadelphia earlier this month. Mill's performance, Inquirer critic Dan DeLuca wrote, proved that the day "unquestionably belonged to Mill." Following that appearance, Mill appeared on The Tonight Show with Jimmy Fallon, where he discussed his current efforts at focusing on criminal justice reform. His appearance on the show was his first since Aug. 2017, when he was arrested for riding a dirt bike in New York City after taping a previous Tonight Show appearance. "We have about 6.7 million people in the criminal justice system today in the U.S.," Mill said on Fallon. "That's five times the rate of the rest of the world. I'm fortunate to have everyone helping me, but how do we help others?" Drake will be in Philly on Sept. 15 and 16, along with Migos.